Canada’s Royal Winnipeg Ballet (RWB) is on tour and will be in the Bronx with its production of Dracula on Sunday, November 13, where they will be performing at Lehman Center for the Performing Arts at 6:00 pm. This writer had the opportunity to talk to Artistic Director, Andre Lewis, who has been with the Royal Winnipeg Ballet for nearly 38 years, 17 of those years as Artistic Director. A native of Gatineau, Quebec, Lewis first became part of the ballet when he was 11 years old. He had an uncle who danced and his sister was part of a production of Nutcracker at her school. The school was looking for male dancers so his sister mentioned the need to her mother who encouraged Andre to get involved. Andre was very athletic so he did not have much difficulty in lifting his female partners, although some male dancers who need to strengthen their upper body do weight training. Andre began his dance training in Ottawa before being accepted into the Professional Division of the Royal Winnipeg Ballet School in 1975. Eventually he joined the Royal Winnipeg Ballet Company itself where he danced for 10 years. As Artistic Director, Lewis has brought to the company new and innovative works. “ I had seen movies and read Bram Stoker’s Gothic novel, Dracula. It occurred to me that it might make an interesting ballet, so I decided to commission it. I approached Mark Godden as choreographer and asked if he would be interested in choreographing Dracula. He found the concept interesting and did his research, incorporating many of the characters from the book. In fact, the RWB is more faithful to the book than many of the movies that have done Dracula,” stated Lewis who has equipped the ballet with everything from gargoyles, bats, wolves and vampires. “The Dracula Ballet is a beautiful ballet. We have created through the wonderful musical score of Gustav Mahler’s Symphony 1,2, and 9 and the opulent sets and costumes, a macabre fantasy that depicts the hundred year old story of Dracula. We have a very mixed cast. One of the dancers who plays Dracula is Asian, another is from Atlanta and the other from Vancouver. It is not about color, or creed, we hire on the ability to perform. The RWB is in its 77th season and is the oldest ballet company in North America. In 1953, when Queen Elizabeth was crowned, she visited Winnipeg. At the time the ballet company was called the Winnipeg Ballet Club. Some of the distinguished citizens approached the Queen wanting to change the name to the Royal Winnipeg Ballet. 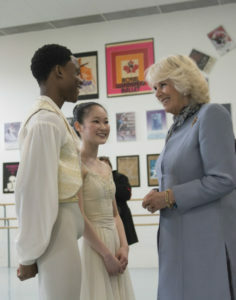 It was the first such investiture of the Queen who honored the ballet with the RWB title,” explained the Artistic Director who has toured the performance troupe of 26 dancers in 581 cities and 44 countries worldwide. RWB has performed the Nutcracker Suite, Carmina Burana, and Going Home Star – Truth and Reconciliation. “I do not know what went on in America but there were places Like Australia, etc., wherein indigenous children were forced by law to go to schools run by churches. The original idea was sound. The idea was to educate these children but its results were terrible. Intentions may have been pure but this practice ended up having terrible results that destroyed families, cultures and created poverty. The Truth and Reconciliation Commission was set up to allow these indigenous people to tell their stories. Our ballet represents these stories. Through the ballet we hope to make people aware of the consequence. We see it as ballet art for social change in the hopes of bringing a message of hope and reconciliation so that people come to see there is no separation. In truth, we all are one,” remarked Lewis of his humane efforts.